Training & Development Archives - strategic HR inc.
June 4, 2018 /in Training & Development /by strategic HR inc.
One of the most frequent complaints that we hear about mid-level managers is, “They don’t manage their people.” A team isn’t meeting productivity goals, has high turnover, and/or low engagement. Add to that, that most companies evaluate their managers on productivity goals, but overlook how they achieve those goals. Are they effectively managing their people, providing feedback, and motivating their employees? We’ve all heard the adage that employees don’t leave companies, they leave managers. With managers being such a critical element in employee retention it’s important that organizations take a hard look at what they are doing to help their mid-level managers be successful as leaders. In a recent survey of 500 managers by business and technology consulting firm, West Monroe, managing their people ranked second of the most common workplace stressors. 44% of the managers that responded said they feel overwhelmed at work. One reason for this may be a lack of management training. Only a third of managers received 9 or more hours of manager training. A startling 44% received less than 2 hours manager training. The good news is, the benefits of conducting management training are many, and well documented. In the West Monroe survey, of the managers that had training prior to beginning their management role, 92% stated they feel they have an adequate work-life balance (i.e. less overwhelmed). 85% feel that their responsibilities are clearly communicated. Providing management training can lay the groundwork for consistency in how employees are being managed across the organization. Effective, well trained managers are proven to improve morale, thereby improving retention, which is critical to a productive workforce. Training your managers goes a long way towards reducing claims and litigation. As we continue to stress, today’s job market is challenging to find the talent we need. Our priority needs to be engaging and retaining the workforce we have. Ensuring your managers are well trained and effective in their roles is one of the most important steps we can take to being a successful organization. Cathleen Snyder, SPHR, SHRM-SCP, is Director of Client Relations with strategic HR inc., and is passionate about manager training. If you would like to share your comments or learn more, contact her at Cathleen@strategicHRinc.com. Have you heard about strategic HR inc.’s Supervisor Training Series? We’ve develop this three-session program to help give your managers the tools they need to effectively manager, engage and motivate your employees. Register your managers today! Sherry Sims is the Founder/CEO of Black Career Women’s Network a national network and community dedicated to the professional growth of African- American women in Cincinnati, Ohio. She works with professionals and college students to help achieve their career goals and has a passion for empowering Black Career Women. For questions or to contact Sherry, ssims@bcwnetwork.com. Training and Development: Are They the Same? Many of you are deep in the throes of your performance management process: reflecting back on 2015 and the performance of your employees and also looking ahead to how you can appropriately prepare your employees to tackle what needs to be accomplished in 2016. It never fails that the performance management document seems to have the all-encompassing “Development Needs” section, and we are always struggling to pick the most relevant training from the list of offerings to address our employees’ development needs and move to the next section on the form. But are we doing our employees a disservice by only focusing on training to address their performance and developmental needs? 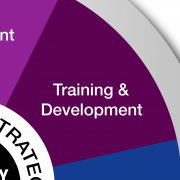 Are training and development REALLY the same thing? Good questions. Remember back to your high school Geometry class when you learned that a square is a rectangle, but a rectangle is not a square? The same is true of training and development. Training is the square: depending on the needs you’ve identified for your employees, training can be an excellent source to prepare your employees to succeed in their current jobs or even potentially prepare them for a more responsible role in your company. Employee development, however, is a rectangle: development may include training (the square), but there are a variety of other ways you can address the needs of your employees that don’t require them to attend a training session. Most of us have benefitted from a training session or two that gave us some knowledge that we didn’t have so that we could perform our job responsibilities a little better. Training is typically focused on making sure we have the information needed to perform our current jobs and our participation is generally required. Some that may come to mind are compliance training or training on a new system your company is implementing. The best trainings help us learn rather than merely expose us to a new topic or new content. Development, on the other hand, goes much deeper than an hour or two of listening to content on one topic. Development is much more involved, usually longer-term and can include things like strengths assessments, job experiences, mentors or coaches, personality assessments, training, 360 degree feedback and many other approaches. Developmental activities are used to prepare employees for the next step in their career and are typically voluntary. Think back to the single most defining point of your career. Did it involve a specific role you were performing or a job experience you gained? A training course you attended? Someone taking you under their wing and supporting your career growth and acting as a mentor? Now, think about each of your employees. Do you want them to look back at the single most defining point of their careers and remember you, the opportunities that you provided for them and the counsel you gave to them? How can you become their rectangle? So, as you’re thoughtfully plowing through your Performance Management documents and identifying some options for developing your employees, make sure to look at their individual needs closely and spend some time thinking through the best method of development for them. Simply choosing from a list of available training sessions may or may not be the best way to help them grow and to help your organization reach its goals for 2016. Brianne Waugh, MA with strategic HR inc. (www.strategicHRinc.com). If you have any questions or would like to share your comments or success stories, you can contact Brianne at Brianne@strategicHRinc.com. In the workplace today, there is so much change taking place, we can’t escape it. But, we have to decide how we are going to handle or cope with each change. So, what is change really?! Change takes place when something is one way but has to become something different. The problem is the current way usually is more comfortable or believed to be normal. On the other hand, the new way is uncomfortable. But change is unavoidable in today’s work world so we have to find a way to accept the new normal. Responses to change run the gamut. Think about the last time your computer operating system changed. How did you feel – lost, frustrated, irritated, uncomfortable…But, as you think about it, would you go back to 2 or 3 versions ago? No, for multiple reasons including the newer ones are better and older ones may not even exist anymore. As you know, change evokes all types of responses – anxiety, fear, irritability, overwhelmed, resentful AND excitement, opportunity, growth, newness, fresh. According to a Change Management program by BLR, there are five defenses to change: deny (if I ignore it, it will go away), blame (it’s management’s fault), delusion (believe it will go back to the way it was), anger (resist and not cooperate), and last defeat (feeling can’t change and give up caring at all). Knowing these “defenses” you can be more aware of whether or not you are responding defensively. Sometimes, how we view or respond to change sets the stage for how we’ll cope with it. “Is the glass half full or half empty?” Will you respond positive or negative; constructive or destructive; engaging or defensive. So, how can we be sure we respond positively? If you are paying attention, you will notice signs that change is needed and/or going to happen. Even change that literally happens “overnight” has signs it is coming. However, we often get caught up in the situation and intentionally may ignore the signs. If we anticipate a change is going to take place, we can better prepare ourselves. When you start noticing the signs, knowledge becomes your power. What do you know about the change? Why is the change happening? What is the goal or purpose of the impending change? What will it look like when it happens? Whether the change is happening or going to happen, seek information to help you understand it. It is far easier to cope with something if you have information, even if it is just a little information. Everyone exposed to the situation is going through the change and likely having mixed emotions both good and bad. But, some people will be responding positively and others negatively. Share your feelings with others but try not to engage with the “naysayer” who will just bring you down more, hold you back and make others resentful of you. You’ve heard these people – “this will never work” or “we’ve always done it this way.” As you share, you’ll find out you are not alone. And, others are having similar emotions. Together you may be able to identify ways to cope with the change. Use the positive talk to help motivate you and help you see the silver lining. If you aren’t paying attention to the signs, change may already be in full swing by the time you notice. It is too late to stop it. The more you try the more frustrated you will become to the point of isolation. You have to accept and embrace the change. Make yourself imagine how it will feel once the change becomes the new “normal”. Get involved in the change by finding out how you can help; and, encourage others to accept the change as well through positive talk. Be sure you are helping resolve problems and not avoiding the “new”. Exercise – keep doing what you are already doing for exercise. Don’t let the “change” alter your exercise routine. But, if you aren’t exercising, add some form of exercise, even a short walk. Distractions – do something for yourself that gets your mind off of the change for a little bit each day. This will help calm your mind and reduce your stress. Goal Setting – establish goals that will help walk you through the change process so you feel more in control of what is taking place. As you accomplish each goal or step in the process, you’ll be closer to making the change and feel the success of the achievements along the way. Reflect – think about past changes you’ve gone through that you survived and even thrived as a result. What did you do that helped make those situations feel successful? Robin Throckmorton, MA, SPHR is with strategic HR inc. (www.strategicHRinc.com). If you have questions or comments about this article, you can contact Robin at Robin@strategicHRinc.com. Over the past few years, I’ve encountered frustrated Human Resource practitioners and Organization Development staff who’ve attempted to provide diversity training for their companies…..with marginal or even negative results. My observation is that there are ten primary reasons why well-intentioned diversity training fails. I’d like to address them in this article. Some companies find themselves developing an Affirmative Action Plan (AAP), perhaps in response to a desire to obtain a government contract which requires vendors to have an AAP in place. Consequently, the company decides to provide “diversity training” to instruct its managers and staff about the technical points in the AAP. While I believe that an AAP is a key component of a diversity initiative, I do not believe that training which covers the numerical calculations employed to develop the AAP will not heighten awareness about dimensions of diversity nor help people understand their individual biases that limit personal and organizational effectiveness. In other words, if you have an AAP and want people to understand it, call the training “Affirmative Action Plan Training,” not diversity training. Perhaps the company President or the Human Resource Director believes that valuing diversity and making an effort not to pre-judge people based on their external characteristics are the “right” things to do. That’s great, but I don’t recommend pulling together a training initiative to try to convince every participant that they should hold these same values. Diversity training should be provided, rather, to help employees understand that certain behaviors, competencies, and skills are valued and rewarded – regardless of age, race, ethnicity, or gender – because they ensure the organization’s success. A successful diversity initiative results from ongoing efforts of many kinds, rather than a one-time training activity. Diversity initiatives typically start with a cultural assessment to discover what employees think about the organization’s recruiting, training, performance management, communication, and human resource development practices. Results are compiled and broken out by characteristics such as gender, age, race, and perhaps tenure and type of position. Following the culture audit, appropriate interventions can be designed. These interventions may include development of a mentor program, training in areas such as conflict resolution and sexual harassment, and redesign of the performance management system. I’ve had managers in my career who’ve said, “I’m behind you all the way.” This is not what I want! I want managers who are leaders, who are showing the way. In order for diversity training to show long-term results, management must do more than foot the bill for the internal or external consultant who is developing and facilitating the training. Specific objectives should be set prior to the training; that is, what does success look like after three months? Six months? A year? Management must serve as a role model for the behaviors identified in the training and be available to address questions or concerns about the topics covered. While some concepts within the realm of managing a diverse workforce exist regardless of the type of organization, “canned” training cannot address every organization’s unique challenges and culture. If a training program covers race and gender issues, but your company has conflict and misunderstanding related to age differences within the workforce, the training is not going to be effective or appreciated. Target your money and your time where the need exists (which you can determine in part from the culture audit). An external consultant can definitely bring expertise and an objective point of view to your diversity efforts. An external consultant does not, however, live in your culture on a day-to-day basis and can’t understand all the organizational nuances and personalities of employees. For this reason, I’ve found that a partnership between a Diversity Council and an external consultant work best for training efforts. This partnership can take many forms, such as “Train the Trainer” sessions that enable internal staff to facilitate future training. Another option is joint design of ongoing training efforts. This is like using a shotgun instead of a rifle. Instead of focusing on specific needs and concerns, several areas are covered during training in the hope that something will strike a chord. A needs assessment, in the form of a culture audit, can help identify what kind of training and what format for training are most appropriate. The Diversity Council and external consultant are then in a position to establish training objectives, design a program that will address participants’ real-world needs, and develop criteria for both short-term and long-term evaluation of the training. There is certainly a need in many organizations to heighten awareness about the value and business necessity for engaging different perspectives. There is a need in many organizations to demonstrate how stereotypes and biases can limit individual effectiveness and put a distance between co-workers. Once these concepts are raised, however, people need to know what to do with them. Follow-on training such as Teambuilding with Myers-Briggs, Resolving Conflicts and Getting to Win-Win, and Coaching for Success are concrete, specific skill building sessions that build on awareness training. If this ongoing training doesn’t occur, people feel that their expectations have been raised and no real change happens. Does your organization have a diversity library? Is there an inclusive mentor program in place? Is ongoing training such as Conflict Resolution offered to people who’ve attended diversity training? Are policies in place and communicated widely dealing with sexual and racial harassment? If these resources are not in place BEFORE the diversity training begins, I don’t have much hope for the long-term success of the endeavor. The biggest question most participants ask at the end of diversity training (or soon afterwards) is, “What’s next?” Participants want to understand the changes that will occur within the organization and their role in making those changes a reality. Participants want to understand what policies and procedures are in place, or will be in place, to ensure that recruiting, performance management, and career development are inclusive. In short, participants will want to know what to expect….and the leadership of the organization must have an answer to that question. Dr. Linda Gravett, Ph.D, SPHR is with Gravett & Associates (www.Gravett.com). If you have any questions, wish to share your comments, or need some feedback on how to incorporate Diversity Training into your company, you can contact Linda at Linda@Gravett.com. After the events of September 11th, we saw individuals throughout the United States and the world come together as one – red, white, and blue. The differences in our personalities, race, gender, nationality, religious beliefs, etc. still existed but our very diversity became a way to show the terrorists that we are all different in many ways but still unite as one – red, white, and blue! Wouldn’t it be nice if we could harness that same energy in our companies so that we worked together as one (but without the tragedy)? You can!!! Whether our economy is in a recession or a boom, there is one common thread that can help our businesses succeed — the people. If we continuously focus on helping people work together, we can attain anything. You just have to create the spirit and energy of Together We Can!!! To really understand how to create that spirit or energy, you need to understand what a team is and some barriers to and characteristics of successful teams. Webster’s New World Dictionary, defines a team as “a group of people working together in a coordinated effort.” This definition really has two parts, and the second is dependent upon the first. We will discuss both parts in more detail shortly, but first, let’s talk about the characteristics of teams. As we talk about the definition of teams in more detail, keep these barriers and characteristics in mind. Think of ways that you can weave them into your teams to ensure that your teams succeed. Two departments may be run in totally different manners. Is one way better than the other? Maybe or maybe not. Perhaps you can facilitate the communication between the departments and have them share what they like about each other’s operational strategy and how can they incorporate that into their department. Do two individuals (or more) within the department have totally different personalities? Perhaps you can use a personality assessment instrument (i.e. Myers-Briggs Type Indicator) to help them realize these differences and together brainstorm ways to use the differences in a positive manner. Plus, there are many exercises you can do with a group to help demonstrate the value of these personality differences that will really open the eyes of the participants or team members. How often do the individuals within or outside the departments interact? Is it only when they “need” something? If so, you probably need to create ways to get everyone interacting with each other before they need something. This could be done through such activities as a social activity, shadowing program, or topic of a weekly meeting. Social activities may be something as simple and inexpensive as a brown bag lunch, a celebrating pizza party, or a pitch in lunch. OUTCOMES – What results am I looking for? BARRIERS – What might prevent me from being successful? SUPPORT – What resources are available? EVALUATION – How will I know when I’ve reached my goal? Throughout all these recommendations, the key is to involve the team members as much as possible. Yes, it may take a little more time, but your end result will be priceless. You will start seeing people interacting with each other with an attitude that – Together We Can!!! Robin Throckmorton, MA, SPHR, a Senior Human Resources Management Consultant is President of Strategic Human Resources, Inc. (www.strategicHRinc.com). If your organization would benefit from a “Team Building: Learning About Yourself and Others” session, please contact her at 513-697-9855 or Robin@strategicHRinc.com for more details. No matter what jobs, positions, or responsibilities we have, sooner or later we are usually asked to train someone on how to “do it.” And, if we are asked often enough, or if the procedures are complicated, now might be the time to document the material we use to train. Over the years I have created a few dos and don’ts that I have found to be useful when creating training materials. First, remember that we’re training adult learners. Adults like to have “hands on” experiences. Stop lecturing. Turn off the PowerPoints. Let’s just “do it” as Nike says. Roll up your sleeves and begin, providing lots of opportunities to practice in order to create the desired outcomes and results. Okay, okay…you have a PowerPoint presentation already prepared…well, go back through it and see how you can make the content more interactive. In other words, if the learners know part of the content, rather than lecturing them, ask them to share what they know. For example, if they are aware of the reasons employees are not providing input to a process, ask them to share it. Don’t tell them what they already know. Besides, you might actually hear something you didn’t know! Make your training interactive. Include activities and “games,” such as role plays, case studies, large and small group discussions…you get the idea. There are tons of books and websites available to peruse when on this quest. And you can always join NASAGA’s discussion board at www.NASAGA.org and ask the various experts what they would suggest. Remember, adult learners come to training classes with experiences and expertise that should be tapped into during the training process. If adult learners link the learning with past experience, they remember it. Tell the learner what they really need to know. If they want to know the history, background, evolution, etc., then they’ll ask. For now, give it to them straight…and only give them what they need to know. In most cases, time is of the essence. Most of us don’t have time for the “nice to knows.” However, do consider notating the extra information in the facilitator guide. Give the adult learner a job aid or a participant guide. And, no, I don’t mean a copy of your PowerPoint presentation. In other words, give them something that will be of value to them during the training process and can be used as a reference back on the job. And, remember, the facilitator guide should provide talking points that further enhance the participant guide content. If you know the material “inside and out,” then you probably don’t need to write a “detailed” facilitator guide. Wrong! That’s the issue. You don’t need a “detailed” facilitator guide, but if you were hit by a bus tomorrow, would someone else know what to do and say? If not, then you better start documenting more of your knowledge. Oh, and be sure to have someone read it later. What is clear to you, may be clear as mud to someone else. Besides, the fastest way to get promoted is to have someone who can competently perform your job! The flow of the content. In other words, is the order logical? The amount of detail used to explain how to facilitate the activities, simulations, and games. The start times, stop times, and breaks. What most of us know, and seem to forget when creating training for others, is that training should be fun…yes, you read that correctly. When you think of the training that you really, really enjoyed, was it fun? You betcha! Let’s “do” make training fun! Copyright 2007 Training-Modules.com. All rights reserved. While you may copy this publication, its content may not be modified. You may, and are encouraged to, share the publication with others who may benefit from receiving it. If you have any questions or would like to share your comments with Strategic Human Resources, Inc. (www.strategicHRinc.com), you can contact us at info@strategicHRinc.com. Strategic Planning…Goal Setting…Are You Still on Track? Do you remember how much time and energy you put into setting goals for yourself and/or your business earlier this year? Do you even remember what those goals were? What actions have you taken toward accomplishing them? Each year, January 1 is a milestone that forces me to establish both my personal and business goals for the year. Whether you have a strategic plan for your business/department or personal goals/resolutions, it is exciting and motivating to set them but very easy to put them on the shelf and forget about them until next year. According to research by Tom Terez, only about one in five individuals make a resolution each year AND actually keep it. Why do so few actually realize their goals? January 1 really motivates us to want to set goals to help us improve something (i.e. lose weight, increase sales, reduce turnover) over the coming year. But shouldn’t there be another holiday about every three months for the purpose of saying “how are you doing” on your goals and resolutions for the year? So, until I am able to get Hallmark to create this holiday filled with lots of cards to remind us, we have to set our own milestones. Many individuals let the pressure of the new year force them to set goals. Unfortunately, this results in goals that didn’t have much thought put into them. Therefore, they are not accurate, realistic, or on-target. Too often, our list of goals quickly becomes a long list of to-dos that completely overwhelms us and ends up lost after just a few weeks of creating it. You can probably only accomplish between 3 – 6 goals a year depending on the scope of those goals. Remember, most goals involve some sort of change and it takes at least 30 days to change a behavior! How often have you heard someone tell you their New Years resolution or business goals and knew right away there was no way that would ever happen? It is great to be optimistic and confident but your goals have to at least be attainable or you will definitely lose the energy and motivation to complete them. A goal is only realistic if you can control the outcome because it is based on your own skills, knowledge, or abilities and cannot be impacted by outside factors beyond your control. Each goal will need a detailed and specific plan of action. To create these steps, I find it helpful to think about these five things: what result, outcome, or benefit do I hope to obtain from reaching this goal / objective? What is going to prevent me from reaching it? Who or what resources can help me to reach it? What will be the specific steps that I will take to accomplish the goal? And finally, how will I know I got there or how will I evaluate or measure it? This last component “how will you know you got there” is often neglected. This is the measurement part of the goal. Be sure you are able to measure whether or not you have reached your goal. Brainstorming goals is great but not enough. You’ll need to write down your goals being as specific as you can so you know what you need to do and when to accomplish a goal. Plus, try to prioritize your goals and actions so you know what is most important and must be done first, second, third, etc. The day to day of our lives and/or jobs is so busy that we often forgot about our goals. This is probably one of the most popular reasons why goals fail. But, many times we are sidetracked by the things that are not going to help us get where we ultimately need to in the long run. And, if we would just review our goals every time this happens, it will help us maintain focus and stay on track. We are all human and we love the feeling of knowing we succeeded at something. But, when we set a goal and actually accomplish it, we basically just “check it off” and move on. You need to celebrate these accomplishments. If it was a group goal, make it a group celebration – pitch in lunch, ice cream at 3:00, etc. If it was a personal goal, do something special for yourself – relax for 30 minutes, get a massage, talk a walk, write yourself a congratulations note, etc. You might be saying, why are we talking about how to set goals when we should be evaluating them. Once you’ve set your goals, they are not cast in stone. There is no law that says you can’t adjust them. And, things do change so you should review and revise them as needed. Part of the goal should include milestones (monthly, quarterly, semi-annually) to evaluate your progress on the goal and revise if things have changed. Plus, how often do we dive into creating new goals before even evaluating how well we did at meeting our past goals? We have to know how we did in the past in order to determine what we need to do in the future to reach our ultimate goals. THEN, we can begin planning. So, whether it is a strategic plan or your own personal goals, most goals are established to help you get from where you are today to where you want to ultimately be. The goals are the actual steps you’ll take to reach that ultimate future. To set your goals, you need to find out where you are now, where you want to be, and how you are going to get there. And, constantly re-evaluate and revise as needed. So, grab your goals that you set earlier this year. Review them against these top ten reasons why they may never be accomplished. Then decide if they need modified based on these reasons or even changes that have happened in your business, economy, etc.? Did you write them specific enough so you know what you need to accomplish and when? And, how do they measure up so far. Now, be sure you celebrate your accomplishments and be sure to revisit your goals on a regular basis between now and December 31 and especially before you reset your goals next year. Robin Throckmorton, MA, SPHR, a Senior Human Resources Management Consultant is President of Strategic Human Resources, Inc. (www.strategicHRinc.com). If you have any questions or wish to share your comments, you can contact Robin at Robin@strategicHRinc.com. What does it mean to achieve perfection? The oldest definition, as written by Aristotle, defined perfection as that which is complete, that which is so good that nothing could be better, and that which has attained its purpose. Aristotle’s definition provides three different flavors of perfection, but all pretty much starting from the same recipe – being finished in a flawless manner. How often do you think about achieving perfection? If you’re a perfectionist, ahem, you might naturally and unconsciously strive for perfectionism in all that you do. If you don’t tend toward perfectionism, you might have to be more concerted in your efforts to produce near-perfect output. The concept of Six Sigma has its basis in perfection and the notion of delivering products or services that are near-perfect. In fact “sigma” is a statistical term that measures how far from “perfect” a process or product is when complete. The object is to get as close as possible to having zero defects when producing a product. Six Sigma refers to the desire to reach near perfection, roughly no more than six deviation points from the mean. That means producing a product or service that has no more than 3.4 defects per million items produced; a product that’s 99.9997% accurate in terms of its quality. Companies are learning that using Six Sigma successfully amounts to a cultural change and requires a shift in thinking throughout the entire organization. But the payoffs are huge: increased profits and market share, improved customer satisfaction and even enhanced employee satisfaction. White Belt – has been taught a high level overview of Six Sigma and how it works. A great introduction for all employees in an organization utilizing Six Sigma. Yellow Belt – considered a subject matter expert, these individuals have a specific knowledge about an area that might not be of primary focus on a Project Team, but bring specific knowledge about their function or area. Green Belt – usually earned by a project member who needs to have a good grasp of the Six Sigma concepts to be productive in Team discussions. Black Belts – are Team leaders who have learned Six Sigma techniques of facilitation in great detail. They are trained in change management and are taught leadership skills needed to run a successful Project Team. Master Black Belts – are individuals who are authorized to teach other Black Belts. They can also mentor and oversee projects using their deep understanding of the statistical needs of the Project Team. In an earlier article I introduced the concept of Six Sigma, the players involved and the fact that Six Sigma can be applied to any organization and to any area of an organization from Manufacturing to IT. What we haven’t discussed is how Six Sigma can be used specifically in HR. As subject-matter experts HR might often be involved on company-wide Six Sigma Teams as Yellow Belt team members. In this role HR is asked to help with issues in other departments that might impact or utilize HR. But what about using Six Sigma within the HR Department itself? What types of things can HR analyze and improve using Six Sigma? Curtailing costs: recruiting, training, recordkeeping, compensation and benefits, etc. This is just a short list of ideas. Once you get a Team assembled to start brainstorming areas of improvement for HR it may be hard to stop them. Just remember to involve all the players within a particular issue. For example, if Marketing is partially responsible for employee communications have a member of the Marketing Department (acting as a subject matter expert – a Yellow Belt) on your Six Sigma Team to make sure you are evaluating the current situation accurately and creating optimum solutions. These Yellow Belt Team members can add a lot to the discussion and often think of solutions that Team members too close to the problem might not easily see. Debbie Hatke, MA, SPHR is a Senior Human Resources Management Consultant and Talent Strategy Manager with Strategic Human Resources, Inc. (www.strategicHRinc.com). If you have questions or comments about this article, you can contact Debbie at Debbie@strategicHRinc.com. Everyone by now has heard of Six Sigma; even if you don’t know what it is. If you’re a recruiter, you’ve probably seen it listed on resumes quite frequently. But what is Six Sigma? If you are an HR practitioner, chances are you haven’t been exposed to this concept in much detail, but you should be. Six Sigma is akin to the Total Quality Management movement of the 1980’s. You might remember – Deming, Juran, Quality Circles, Statistical Process Control (SPC) and Continuous Process Improvement (CPI). These are all concepts that are associated with Total Quality – the idea of improving overall quality in the workplace by making incremental quality improvements or maintaining quality standards. Six Sigma more or less looks at quality in more detail; statistical detail if you will. It focuses on the number of defects that might occur in a product and works to reduce those defects. In fact, the term Six Sigma refers to the desire to shoot for near perfection – defined as no more than 3.4 defects per million items produced; that’s 99.9997% accuracy. While you might think that being 99.9997% accurate in terms of producing a quality product or providing a service sounds a little lofty, when you stop to look at the numbers it becomes apparent why companies are so concerned with a Six Sigma level of quality. In a recent class provided by the NHRA of Cincinnati, Paul Gormas, of the International Society for Six Sigma Certifications, explained it this way: accepting an accuracy level of “only” 99% would mean tolerating about 20,000 lost pieces of mail per hour or living with no electricity for 7 hours each month (and many of us living in the Greater Cincinnati area know from September 2008 how that might feel). If that isn’t an eye-opener, imagine having one of the 5,000 incorrect surgical operations that might occur each week if held to only a 99% accuracy level – no thank you! In addition to taking a more statistical approach to managing quality, Six Sigma takes the quality movement a step further by demanding cultural change – which is where HR comes in. By looking at people processes, Six Sigma changes those elements of a process that result in defective products. This often involves changing how employees work and requires an organization to address the needs of its customers; both internal and external. Six Sigma works to reduce variation in product (defaults) by using standardized processes, specific metrics to measure progress and unifying the organization in terms of the processes, metrics and language used. Human Resources, because of their expertise in facilitating cultural change, is instrumental in achieving success with Six Sigma. Six Sigma projects revolve around the activities of a Team. In most organizations a Quality Counsel will identify Six Sigma initiatives that the organization should attempt to tackle based on need. Someone at the executive level typically sponsors the initiative and forms a Team. A Six Sigma Project Team will have a business sponsor, a process owner (typically the supervisor), a team leader (who is a black belt) and project members (who are green belts). The Team may also have other resources involved (such as HR or Finance) who would require Six Sigma knowledge at a yellow belt level. A “White Belt” individual has been taught a high level overview of Six Sigma and how it works. When beginning a Six Sigma program in an organization it’s a good idea to educate employees on the overall process and a White Belt is where to start. Someone with a “Yellow Belt” is considered a subject matter expert. These might be individuals who work in HR, IT or Accounting. They have a specific knowledge about an area that might not be of primary focus on a Project Team, but bring specific knowledge about their function or area. A “Green Belt” is usually earned by a project member. They need to have a good grasp of the Six Sigma concepts to be productive in Team discussions. Team leaders are “Black Belts”. They have learned Six Sigma techniques of facilitation in great detail. Black Belts are trained in change management and are taught the leadership skills needed to run a successful Project Team. “Master Black Belts” are individuals who are authorized to teach other Black Belts. They can also mentor and oversee projects. They have a deep understanding of the statistical needs of the Project Team. Despite the seemingly stair-step design of the different belts, it is not necessary to progress through each rank to earn a Black Belt. A Team Leader can be trained as a Black Belt without going through the other training. Six Sigma is very methodical and there are set methods for laying out the issues and developing solutions. Once all the players are assembled, it is up to the Project Team to identify and define the stated problem and work through the various Six Sigma exercises and metric analysis to come up with a resolution. HR can be very helpful either as a Project Team member or simply as an ancillary resource in accomplishing the goals of a Six Sigma project. Schedule and conduct employee training! Ugh – It’s time for performance reviews! In HR, our focus is on assisting other people. Whether it’s addressing an employee relations issue, helping our employees be healthier, or simply being better employees, our time is consumed with doing things that are focused on other people. There never seems to be enough hours in the day, and often we are understaffed. When was the last time you stopped to think about your own development? What was the last training session you attended? How about the one before that? You get the email newsletters, but do you actually take the time to read them? Or are you like me, lately, they get tucked in the “To Be Read” file, but never read. Or worse, just deleted because I have conceded that I’ll never get to them. Let’s face it, often we are our own worst employees when it comes to making time to do our own training, or ensure we are staying current. Now that the economy has stabilized we’re all celebrating that training is back on the radar. Unfortunately, we are so busy planning everyone else’s training, we don’t take the time to consider our own. As HR professionals we need to practice what we preach. We all have employees that we have to shove into training, lock their office door, turn off their cell phones and de-activate their email access. Don’t be our own worst training problem child. One of the things I love most about Human Resources is that things are always changing and evolving. It’s the nature of our field. We work with people. However, in order to keep up with those changes, we have to make sure our own training and staying informed is a priority. We are fortunate that we have many opportunities to do so. If we choose, we can be bombarded by training opportunities, whether via webinars, seminars, classes or whatever our chosen means. Many of them are low cost or even free. GCHRA offers several monthly programs on a variety of disciplines, that are not only informative, but a great networking opportunity. Local Chambers of Commerce, law firms, and other organizations have regular offerings on HR related topics, again many at low cost or no cost. There is an abundance of free or paid subscriptions for newsletters, blogs, updates and twitter feeds for the choosing. It’s only a matter of deciding which ones are most relevant to your area. Like any area of expertise, the field of Human Resources is evolving constantly. Yes, we are impacted by new technology, not only the direct use in our jobs, but also extended impact on our workforce (i.e social media and smart phones). Toss in the whims of the legal system and the ever changing workforce and culture in general, and what they expect from an employer, and your head will start to spin. As HR professionals, we can’t afford to not be in touch and stay current. To say that the tangible and intangible consequences are significant is an understatement. Commit to yourself to do attend one seminar or webinar a month. The convenience of a webinar means this can usually be accomplished in one hour! There are other programs to attend in person that are more than worth the additional time commitment. Commit to 15 minutes a day to read newsletters/blogs and feeds. I try to start my day this way, while I settle in with my tea. I find it helps me begin my day informed and ready to go. Commit to networking with one person outside your organization per week. Whether it’s sending an email to someone you have known and need to reconnect with, or reaching out to a new contact you chatted with at a recent event, building your network can only be have positive results. When you are waiting for a meeting to start, use your phone or tablet to actually go to your “To Be Read” file, and catch up on reading. You would be surprised what you can learn in a brief amount of time. Congratulations on taking the time to read this article! That’s the first step. Now, scan your inbox for the next event or webinar to attend and block out 15 minutes a day on your calendar to read a newsletter. We are HR, if we are not keeping up on our own development, we have no one to blame but ourselves. I think it’s safe to say that performance evaluation meetings are often dreaded by both managers and their direct reports. Part of the reason is that it’s difficult for managers to be objective during the performance evaluation process, and direct reports perceive the process to be uneven and inconsistent. Yet, in order to recruit and retain today’s workforce, our organizations must effectively evaluate employee performance. In this article, I’d like to focus on ways to effectively measure employee performance by assessing not just efficiency or traits but the skills, knowledge and competencies that support your organization’s viability in a systemic, meaningful way. The first step is convincing line managers of the importance of performance reviews in relationship to the organization’s success. We don’t simply conduct performance evaluations as a “feel good” activity for employees. (That’s a good thing, because if that were the case, we’d be failing miserably!) Research shows that there’s a direct and positive correlation between effective performance feedback and productivity. If we provide clear, concrete feedback to employees about how their role supports the mission, vision and objectives of the organization, we’re more likely to have employees who act in a way that adds value; that is, by enhancing customer satisfaction. The purpose of the appraisal process is multi-dimensional. Certainly, this process can be used to determine salary increases and promotions. In addition, this process can appraise performance relative to one’s job duties. One of the biggest complaints I hear from employees is that their job description and performance evaluation are two completely different entities. The duties they were hired to do bear no resemblance to the duties for which they’re evaluated. If you’d like to see a sample of a parallel job description and performance appraisal instrument, email Dr. Linda Gravett at Linda@Gravett.com. The appraisal process is also a means to open the lines of communication about the organizational needs, the individual’s areas of growth required to support those needs, and metrics that describe success. To successfully conduct performance evaluation meetings that meet the needs described above, there are some specific competencies that line managers and HR need to acquire. Communication skills, the balance between active listening and talking, are the most critical. Next, goal setting using “SMART” goals is a must (Specific – Measurable – Achievable – Realistic – Time Sensitive). A third competency is the ability to provide constructive feedback; i.e., feedback that is objective, clear, and specific. The last competency that is critical is the ability to select appropriate metrics and apply them consistently across employees. In terms of measures, I want to caution against setting simply efficiency measures without also setting effectiveness measures. When I was new to the field of HR, my job required me to do quite a bit of recruiting. My boss really pushed getting applicants in the door, conducting the interviews and testing, and then making quick decisions. I learned to do this in a way that was definitely efficient; however, over the long term, my decisions, and the decisions of others doing the recruiting, were not always the right decisions. Some of the new hires weren’t the best fit for the department or the organization. Over time I learned that a better test for recruitment became the quality of new hires and their retention. During the reporting period, I believe we need to ensure that employees not only have the willingness to do the job but we need to ensure that they have the ability and means to do the work as well. I can decide I’d like to move one of my office walls out five feet and be very motivated (willingness) to do so. If I try to walk up and shove the wall five feet, I’ll fail because I don’t have the ability (architectural knowledge) or the means (equipment to actually move the wall). I encourage you to think about whether you’ve provided employees with a workplace environment that’s conducive to employees doing their best work as well as the resources they need to do their work. Otherwise, performance evaluations will be meaningless. Let’s get down to a real issue with performance evaluations – the numbers dilemma. There is a widespread perception that numbers are subjective. For instance, people ask me often, “just who is Likert, and why is that scale used so often?” Some supervisors are “tough graders” who don’t believe anyone is deserving of an outstanding rating. Lastly, there’s simply not enough clarity around examples of competencies or skills. What does “communications skills” look like exactly?! For the above reasons, I’ve found that competency-based job descriptions and parallel evaluations are especially useful because they describe behaviors that successfully encompass, for instance, communications skills. If an employee always demonstrates the behaviors established for success with this competency, he or she can be rated “outstanding” or 5 on a scale of 1 to 5, for example. If an employee almost always demonstrates the described behaviors, their rating can be “very good” or 4 on a scale of 1 to 5. Obviously, there needs to be a “meeting of the minds” across managers around descriptions of the competencies that lead to success in your organization, and you can help guide them through this important discussion. Start with the strategic objectives of your company. In order to achieve them, what competencies will be required across your organization? These are the competencies that should make up your performance evaluation instrument! Dr. Linda Gravett, Ph.D, SPHR is with Gravett & Associates (www.Gravett.com). If you have questions or comments on this article, you can contact Linda at Linda@Gravett.com. Birth Order: How Does It Impact You in the Workplace? Does the order in which you were born predict any common traits about you? Want to see? Try this quiz before you read this article to find out: Birth Order Quiz. Did the quiz correctly identify your birth order? Did it provide an accurate description of your personality? Or, did it do both? Like any assessment, there are so many variables that could impact the accuracy of the tool. We have to keep in mind that it is a gauge to help us understand the people around us better but not meant to be the definition to the letter. With the case of birth order, it is important that the siblings be no more than six (6) years apart in order to classify someone as being a first, middle, or last child. Furthermore, many variables such as socioeconomic class, gender, and even the birth order of the parents could have an impact on the accuracy of these predictions. Nonetheless, having something that we can use as a benchmark to understand the person sitting next to us can only help as long as we don’t take it as the Gospel, right? As we discuss each of the different birth orders below, think about how these traits play out in the behaviors and personalities you see in your friends, family, and co-workers. Keeping this in mind might help you understand a little bit more about why these people are the way they are. As with anything, once you understand and accept a person for the way they are, the more likely you are to get along with them. Don’t try to change them to be like you but rather use their differences to make you stronger. You’ll know you are working with a first born because he or she will likely come across as being very assertive and confident. This individual may be fearful about losing their position or rank and will do what it takes to defend it. To be comfortable in the work place or any place for that matter, A First Born must be in control. They are born leaders. Robert Feeney describes First Borns in his article Increasing Employee Retention with Birth Order, as being practical, confident, and able to delegate and make rapid decisions. These are all great traits for leaders. However, these traits aren’t without flaws. In the article How Your Birth Order and Management Style Connect, First Borns are described as being intolerant of those that do not work 100%, are not necessarily team players, and tend to avoid risk. Nonetheless, most of the research points to First Borns and Only Children as being very strong leaders. In fact, in a survey by Vistage of 1,582 respondents, 43% of the CEOs were First Born. Likewise, USA Today conducted a similar study of 155 CEOs and found 59% were First Born. Can First Borns be tough to work with? Some might say yes but they can also be great leaders that overcome a lot with their determination. Observe their traits and learn to accept them for who they are, and make those traits strengths in the workplace. For those you work with that fall in the middle (2nd or 3rd born perhaps), we (because we both are) tend to be very independent and a bit more unconventional on the job and in our personal lives. We are indeed more empathetic and relationship focused, which makes us great team players. It is also a known fact that we are considered peacemakers, meaning we are a good resource to turn to when it comes to conflict resolution. From a leadership perspective, we are not quick to voice our opinion and we prefer to search for options. Because of this, we do not make hasty decisions. Furthermore, according to How Your Birth Order and Management Style Connect, we are excellent risk takers and have a creative edge in our management style. As a result, we are outstanding small-business managers and owners because of our innate creativity and natural ability to work with others. Like First Borns, we all have our strengths and our weaknesses. To work with Middle Borns, you have to find to find a way to capitalize on our strengths and accept our weaknesses. According to the aforementioned article, Middle Borns may need additional assistance if they lack general business skills. Although their ability to be the peace-maker and negotiator will ultimately help them, a lack of necessary business knowledge could lead to the demise of their career. As the baby of the family, you can probably see the Last Born coming from miles away. They are the ones that are very outgoing, risk-oriented, and creative. Last Borns are also quite spontaneous according to How Your Birth Order and Management Style Connect, which can be both positive and negative in the workplace depending on the situation. Lastly, they are used to getting their way, and if turned down they know every trick in the book to get what they want. Whether you enjoy the company of the Last Born, the life of the party, or find it hard to work with someone like this, Last Borns bring a great deal to the workplace too. We need that spontaneity and someone willing to take risks. The article How Your Birth Order and Management Style Connect points out how Last Borns strive to get to the top of their career through every way possible, including taking risks. Someone with this drive is certainly a positive in your company. Frank Sulloway even writes in his book Born to Rebel that Last Born or Younger Born that scientists are more likely to be in support of new or revolutionary theories. However, it is important that Last Borns do not let their impulsiveness ruin their career. Although this kind of originality has led to some of the greatest inventions, it should be monitored in the workplace to prevent major business mistakes. Only children are much like First Borns, but tend to mimic adult behavior from the beginning. The Only Child tends to be very self centered and an extreme perfectionist. Some say the Only Child can come across as impersonal. You’ll often find them just doing the work themselves rather than delegating it because of this perfectionism trait. For this reason, they will also impose very high expectations on their fellow co-workers or subordinates. They are definitely not quick to forgive. But, as Robert Feeney described in his article, they are very self motivated and extremely independent. These can be extremely positive traits to have in workplace, especially if you are managing this individual. Do all the traits fit every individual in a category? Absolutely not! But, as you sit next to someone or work for someone, think about how they may fit into the birth order and how that may be affecting the behaviors you observe. There are always going to be conflicting personalities in any environment, including the work environment. Classifying a co-worker or boss’ personality based on their birth order is never going to be a completely valid predictor of behavior, but it is certainly an interesting tool that should be kept in mind when observing others’ conduct. If someone you work with tends to exhibit some of traits that match their birth order, you can keep it in mind as you communicate and work with that person in the future. Overall, considering birth order as you interact with co-workers may help you understand them better and become more aware of why they are the way they are. Robin Throckmorton, MA, SPHR, a Senior Human Resources Management Consultant is President of Strategic Human Resources, Inc. (www.strategicHRinc.com). Allison Pyles, CIR, PHR, is a Human Resource Generalist at Strategic Human Resources, Inc.If you have any questions or would like to share your comments or retention strategies, you can contact Robin at Robin@strategicHRinc.com or Allison at Allison@strategicHRinc.com.